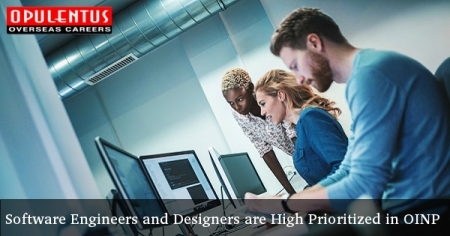 The progress report on the immigration strategy of Ontario province has revealed that the Software Engineers and Designers topped in the occupation category among the provincial nominees during the year. These inevitably followed by Interactive Media Developers and Computer Programmers. China and India provided them in large numbers. The update issued by the Ministry of Immigration and Citizenship provides details regarding the OINP and main components of the immigration strategy followed by the province. I started in 2012 for tackling the shortage of skilled labor faced by the region. This Program permits Ontario in nominating persons (and their families) to obtain the PR status. The categories in focus in the program are skilled workers, international students, and entrepreneurs. It works together with employers and supports their attempts to attract and retain the skilled workers. The nomination target in PNP for 2017 allotted to Ontario was 6,000 which was a record high allocation seen in the decade. IRCC also made an extra allocation in December. The report states that the immigration strategy aimed to make improvements in the OINP, and campaigning for a significant increase in the number of nominees to be placed in the province. There was a significant gain in Ontario, and its allocation has increased from 1,300 to 6,000 nominees in a matter of four years only. The country of birth illustrated that India sent 1,835 nominees at the end of September 2017, followed by China with 1,608 nominees. Launching two new immigration streams - the Express Entry: Skilled Trades Stream and Employer Job Offer: In-Demand Skills Stream pilot led to the improvement in response in meeting the requirements of the labor market during the year. To meet the massive demand for the OINP, the Human Resources Department expanded, and the online application system was introduced to decrease the processing time.The report added that many applications now processed within 60 days from the date of application. It is important and reinforces the commitment of the ministry to provide ideal customer service. The Human Capital Priorities Stream, which is aligned with the federal Express Entry pool, was kept open on different occasions in 2017. It permits the OINP to search for qualified candidates in the pool, and give them the Notifications of Interest, which is an invitation for submitting applications with the goal to get the certificate of provincial nomination. A new initiative linked to Human Capital Priorities was launched in June 2017 which gave preference to candidates in the Express Entry pool who possessed work experience in 15 occupations which are related to Information and Communications Technology. The Government of Ontario worked closely with the federal government to reform the temporary foreign worker system and also helped to introduce the Global Skills Strategy and the Global Talent Stream in June 2017. It is a two-year pilot with the goal of improving the business community in Canada to find the top global talents with various demand skills. The GSS also offers a 14-day service for processing the Labour Market Impact Assessment applications, in the temporary foreign workers' category, and provides help to employers in understanding the immigration options. Ontario has attempted to coordinate with employers, to know the challenges and recognize requirements of labor market through roundtables (called Minister’s Employers Tables). Developing a Business Advisory Council Bridge Training. During the year 4,758 skilled and new employees completed a bridge training program, which was funded by the Ontario Government. This initiative helped them by removing existing barriers and increasing the numbers of trained professionals, possessing a license in their professions. 294 fresh employees’ attained permits and 4,418 found work in their domains. Ontario will receive $91 million funds for further bridge training programs in the 2018-2021 period, under the Canada-Ontario Immigration Agreement.